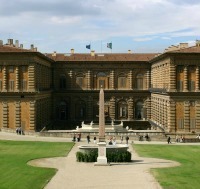 The Opera del Duomo Museum was first opened in Florence in 1891. 'Opera' literally means 'work' and that's what you can see here, all the works carried out for the cathedral Santa Maria del Fiore, the bell tower and the baptistery. Construction of the Florence Duomo complex started in 1296 when the first brick was laid for the basilica. The OPA - the organization to oversee the work - was set up way back then and still exists today within the museum headquarters. Through the years however most of the art decorating the structures has been removed from its original location and placed inside for conservation. Hence, a building which originally served as a workshop for sculptors, bronzesmiths, painters and architects was turned into a museum. Works here include Ghiberti's newly restored masterpiece, the 'Gates of Paradise', the bronze doors made for the baptistery, now on display again after a 27 year restoration project. 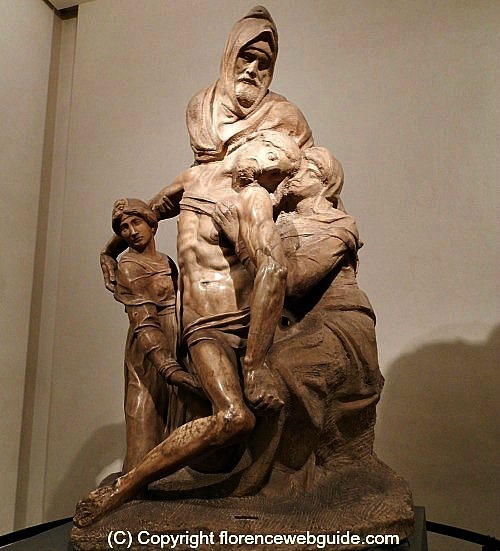 The Works of the Duomo museum is also home to Michelangelo's 'Pietà Bandini', the sculpture that the renaissance master created for his own tomb. The collection goes on with sculptures, reliefs and painting by Donatello, della Robbia, Pisano and others. What's unique about the Opera del Duomo Museum is that you get to walk amid the same rooms where the Renaissance masters themselves (Brunelleschi, Donatello and Michelangelo) actually carried out the works that people today come from all over to admire. Without a doubt the most famous work in the Opera del Duomo museum is Ghiberti's tour de force, 'Le Porte del Paradiso', made between 1425 and 1452. 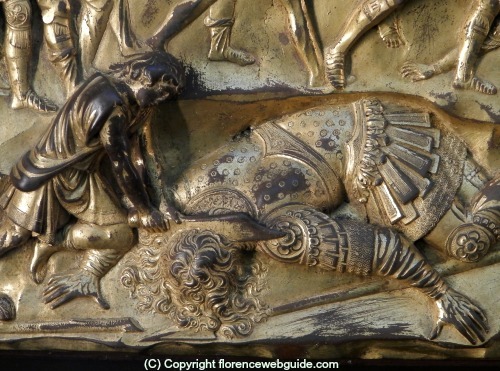 One of the most celebrated events of 2012 - on an international level - was the return of Ghiberti's masterpiece to the museum after a meticulous cleaning process which took 27 years. For decades traffic had been allowed to pass right by Duomo square and pollution from the cars had turned the bronze reliefs nearly black. 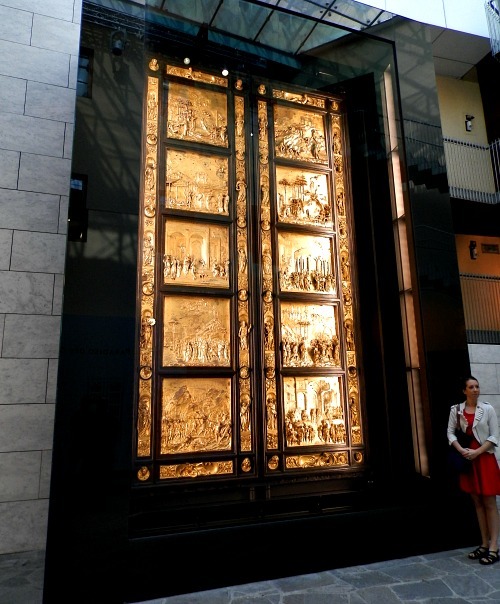 Now the doors have returned to their original state and are on display in the covered courtyard of the Opera del Duomo museum. The whole courtyard of the Opera del Duomo is dedicated to Ghiberti's doors: their making and recent restoration. Each of the panels and the stories depicted in the sculpted reliefs are described in clear detail for greater understanding. Also, the restoration process is shown from beginning to end through the aid of videos showing all that is involved in the handling of such a valuable and rare piece of art. 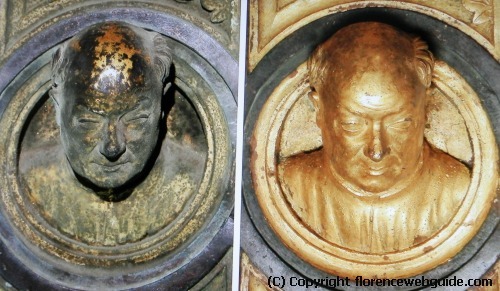 The pic below shows a before and after shot in the restoration process. The panels on the 'Gates of Paradise' depict stories from the Old Testament. Below see a detail of David beheading Goliath, yet another image of the biblical hero who has been the subject of several Florentine masterpieces from the Renaissance. Find out more about Ghiberti's famous bronze doors: the history, the stories of the panels, how these works influenced the Renaissance and more pictures. The Pietà Bandini, aka the Pietà del Duomo by Michelangelo is another of the most admired pieces at the Opera del Duomo Museum. Of course, Michelangelo's most famous 'Pietà' sculpture is the one in St Peter's Basilica in Rome which was done when the artist was only about 24 years old. This pietà - vastly different - was made when Michelangelo was about 80, and very conscious of his approaching death. He worked on the sculpture for 8 years, from 1547 to 1555. The story goes that the artist eventually became frustrated with the poor quality of the marble, and, in a bout of depression, attacked the statue with a hammer. 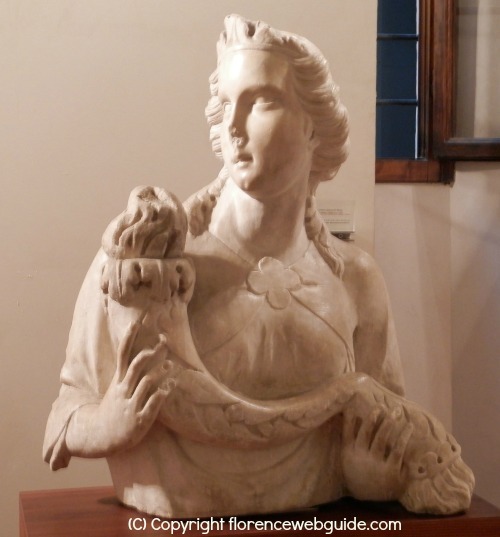 One of the maestro's pupils, Tiberio Calcagni, rescued the sculpture and managed to keep it safe, repairing the damage done and finishing the figure of Mary Magdalene. This Pietà is a bit haunting, probably due to the gloominess of Michelangelo during this phase of his life which subsequently came out in his art. 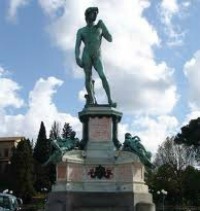 In fact, it is said that the sculpture was intended by the master to be used for his own funeral monument. 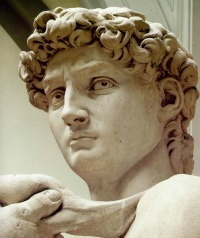 Indeed, Nicodemus - the hooded figure - clearly has been given the features of Michelangelo (see pic above). Many people think that this work is incomplete, but acutally Michelangelo had a habit of intentionally leaving some parts of his marble sculptures 'rough' and unfinished looking. This was to provide a contrast between the perfect symmetry of one figure with the darkness or muddiness of another and was a technique used also by Donatello. A cantoria is a balcony-like box where the choir stands to sing the liturgical chants. 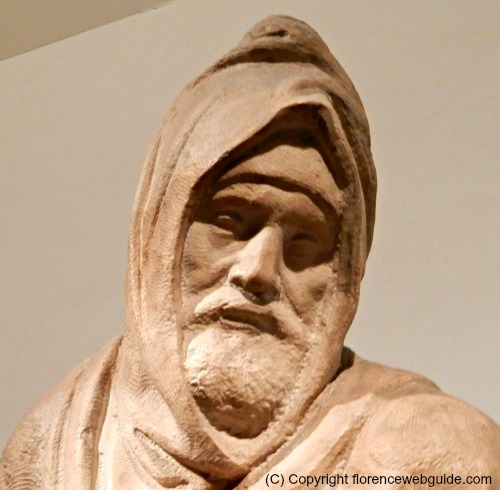 The Opera del Duomo Museum has two very famous cantorie, one by Donatello and one by Luca della Robbia. These singing tribunes both go back to about 1435 (and thus, early renaissance works) and were originally positioned in the Duomo near to the two sacristies. In 1688 however, Ferdinando de Medici - whose wedding was to take place in the church - decided that they were 'out of date' and had them removed. They can now be admired up close in the museum (in fact, the whole idea of a 'Duomo Museum' was first conceived for the purpose of displaying these very 2 pieces!). 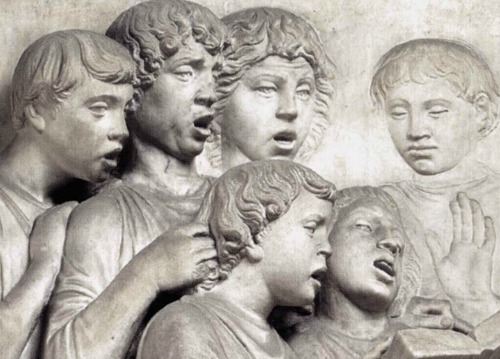 Della Robbia's singing tribune was made first, between 1431 and 1438. 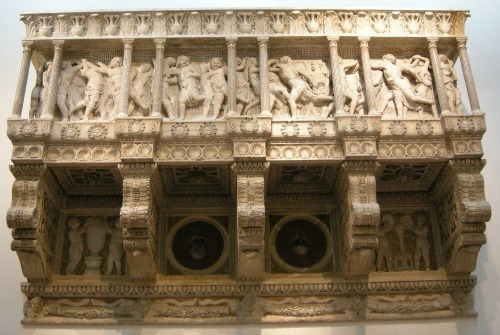 The museum lets you see the original reliefs up close, as the panels are hung at eye level on the wall, while replacements are in the cantoria higher up (see pic above left). Della Robbia's work is inspired by Psalm 150 by Kind David which speaks about praising the Lord with music and dance. The pic below shows a close up image of the classical symmetry and detail of emotional expression of the faces of the singing boys. The Renaissance was known for bringing greater realism and humanism to art, something which this early 15th century work by della Robbia illustrates. Finished after della Robbia's cantoria, Donatello had a tough act to follow. 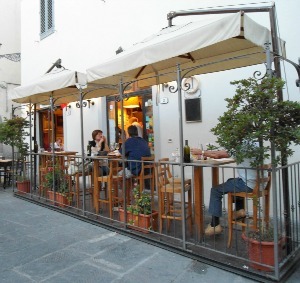 The OPA considered the first cantoria an exceptional work and smashing success, something which they did not hesitate to point out to Donatello! Moreover, Donatello's work was to be placed in an area of the cathedral that did not get much light, an obstacle that he had to also try to overcome. He did this by using mosaics to provide shine and reflection. Much of his cantoria - the background and dividing columns - is decorated with small colored tiles. Donatello's cantoria (1433 - 1439) does not have separate scenes like della Robbia's, but depicts a single row of dancing putti. This latter work also has one particularly distinguishing feature: two bronze heads in the classical style set just under the loft (pic left). It is a well known fact that Donatello spent much time in Rome studying the antiquities, the influences of which are clearly seen in his cantoria which resembles to some extent a Roman sarcophagus. Donatello also does something else that is 'ahead of his time', he leaves his reliefs with a rough unfinished touch, very different to della Robbia's highly polished and almost perfect faces and bodies. 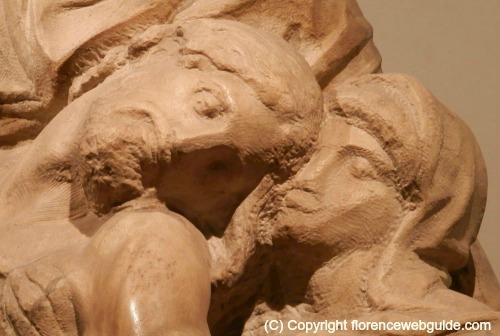 This technique would later be used by Michelangelo (as mentioned above for his Pietà, but also in other sculptures), and was called the 'non-finito' (unfinished) look. Giotto's bell tower has three 'storeys' of decorative tiles and statues. After about 1930 all the originals were moved to the Opera del Duomo Museum and replaced with replicas. Here is where you can see - up close and without straining your neck as you do to see them on the bell tower! - the tiles and lozenges by Giotto (or his pupils, attribution is not certain), Pisano, and Della Robbia. The tiles and lozenges ornate the first two 'floors' of the tower, whereas the third row of the campanile is decorated by statues of biblical figures. The sixteen original life-sized sculptures by Donatello and Pisano are on display at the museum and can be appreciated much more easily at face-level than high up on the tower. If you would like to read about the images and symbolism of these tiles, lozenges and sculptures go to this section of Giotto's Bell Tower page. Another piece that the Opera del Duomo Museum is quite well known for is Donatello's sculpture of Mary Magdalene (dated 1455). This statue is a rare example of a wood sculpture, wood being a material no longer in vogue in the Renaissance. Donatello - always one to 'think out of the box' - chose wood on purpose for the unique effects that he would be able to create in the soft pliable material. Sculpted originally for the baptistery, Magdalene is seen emaciated with hollowed eyes and long strangely hair covering her body - the image is almost ghastly. 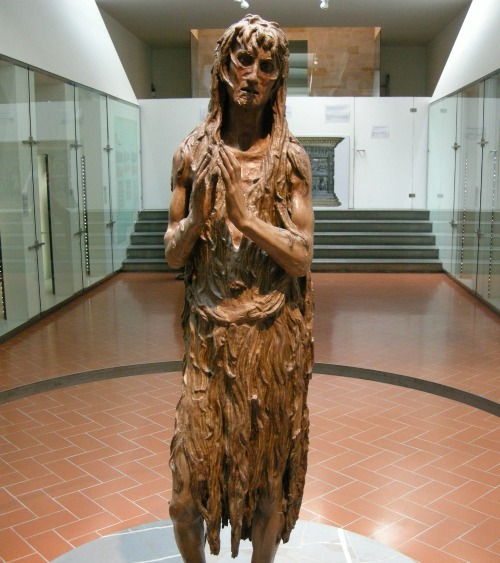 This is Magdalene just after Christ has freed her of the 'seven demons' that were tormenting her soul. Admittedly not a simple moment to convey, Donatello succeeds in communicating both the anguish and the relief of this pivotal event. 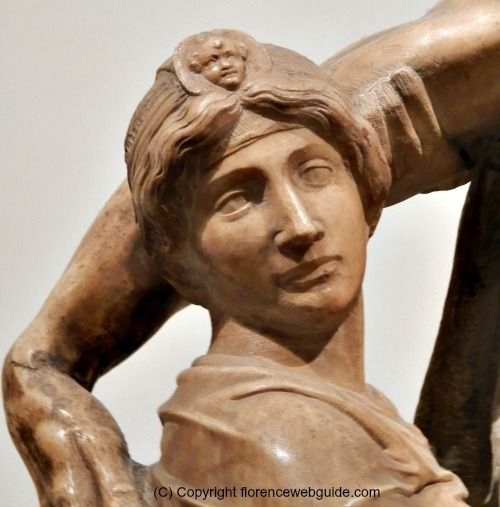 Made for the original facade of the Duomo, the sculpture of St. John the Evangelist by Donatello is another important work by the Renaissance great at the Opera del Duomo Museum. 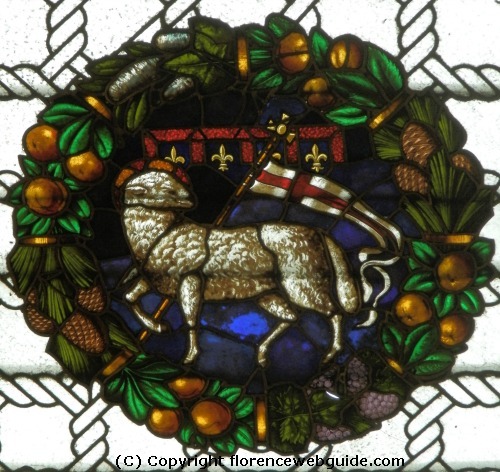 Commissioned in 1408 by the OPA, by 1415 the artist still had not completed the work. Tired of waiting, the Opera authorities served Donatello with a notification that he would be fined if the statue were not promptly completed (which it then was). 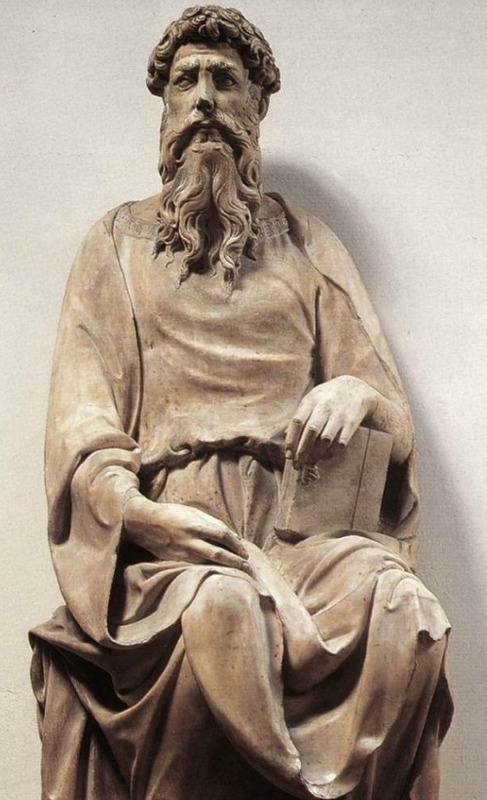 Saint John was actually sculpted in the cathedral, in a private chapel given to Donatello to allow him to work independently and hidden away from 'prying' eyes. Competition was fierce amongst artists who were always trying to protect their ideas, and Donatello was already considered a genius whose ideas would have been well worth stealing. In fact, this work was most likely the inspiration for Michelangelo's 'Moses' which was sculpted about 100 years later but has much in common with Donatello's St. John. 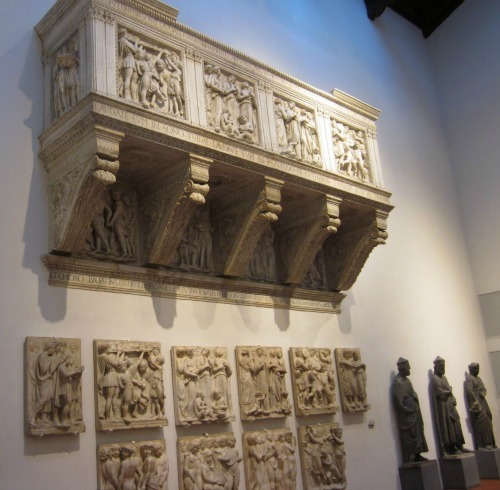 The Opera del Duomo has a small collection of relics from the Etruscan period and Ancient Rome such as fragments of sarcophagi and other funerary art. 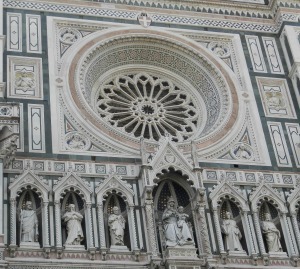 What do these pieces have to do the the Duomo complex? 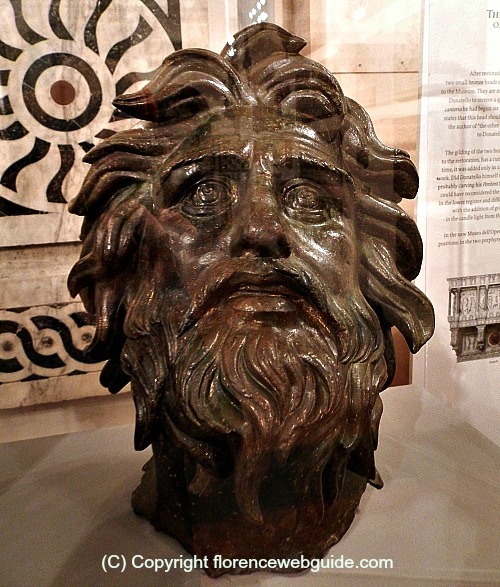 These exhibits are made up of remnants that were found from the period of ancient Florentia which were then built into the structures of the church, bell tower and baptistery. Indeed, in reading about the baptistery of Florence we saw that still today there is a Roman sarcophagus built into one of its exterior walls. 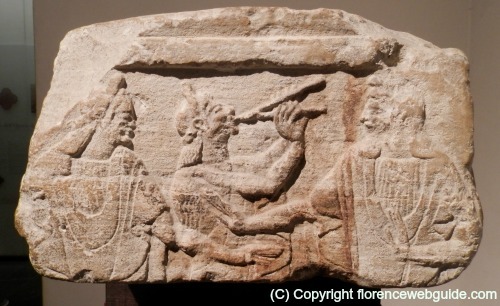 Such fragments are reminders of Roman and Etruscan life of the Florentia that existed centuries before but which could still be found in the Florence of the Middle Ages. 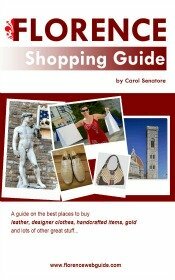 This last section covers much of what you will see in the remainder of the Opera del Duomo Museum. 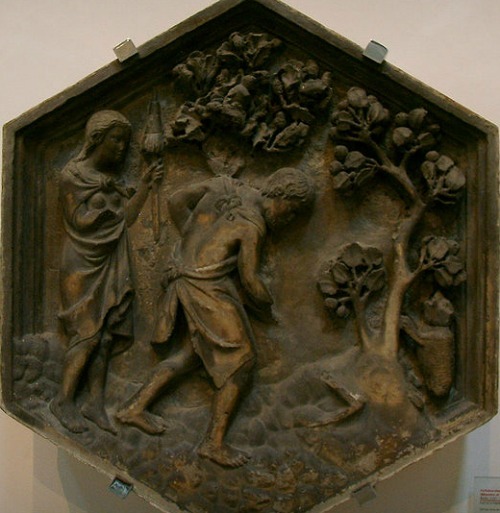 Tino da Camaino was an artist from Siena who made a series of sculptures for the baptistery at the beginning of the 1300's. These Gothic works were eventually substituted by more 'modern' statues but can be seen at the museum. Although the Cathedral was consacrated in 1436, it didn't get its definitive facade until 1871. In these 400 years of 'limbo' many proposals were made for the church front and several temporary facades were installed. The museum houses a large display dedicated to the facade, with designs and models made over the years as proposals for how to finish off the basilica front. 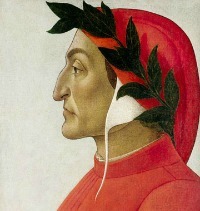 Once Brunelleschi's dome was completed, many of the paintings decorating the altars were removed from the church interior. With its dome, the basilica had acquired a classical symmetry more suited to a simplified interior. The museum has a large display of the painted works that used to decorate the inside of the church. 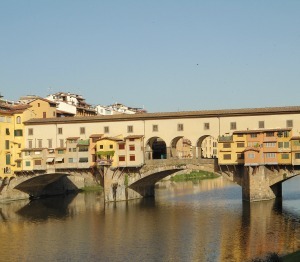 Which brings us to Brunelleschi's dome, which has its own display at the museum. This is where you can see models of the cupola, tools and equipment used for its construction, original sketches of the architecture involved and also the death mask of Brunelleschi.